The termites are a group of eusocial insects usually classified at the taxonomic rank of order Isoptera (but see also taxonomy below). Along with ants and some bees and wasps which are all placed in the separate order Hymenoptera, termites divide labour among gender lines, produce overlapping generations and take care of young collectively. Termites mostly feed on dead plant material, generally in the form of wood, leaf litter, soil, or animal dung, and about 10% of the estimated 4,000 species (about 2,600 taxonomically known) are economically significant as pests that can cause serious structural damage to buildings, crops or plantation forests. Termites are major detritivores, particularly in the subtropical and tropical regions, and their recycling of wood and other plant matter is of considerable ecological importance. Their role in bioturbation on the Khorat Plateau is under investigation. As eusocial insects, termites live in colonies that, at maturity, number from several hundred to several million individuals. Colonies use a decentralised, self-organised systems of activity guided by swarm intelligence to exploit food sources and environments that could not be available to any single insect acting alone. A typical colony contains nymphs (semi-mature young), workers, soldiers, and reproductive individuals of both genders, sometimes containing several egg-laying queens. 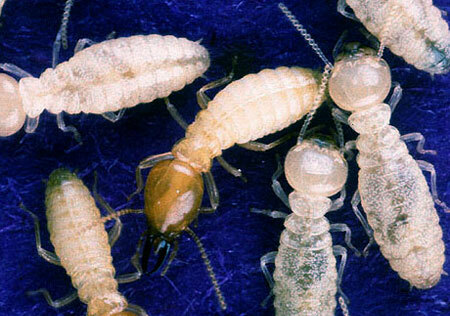 Termites are sometimes called "white ants", though they are not closely related to true ants.